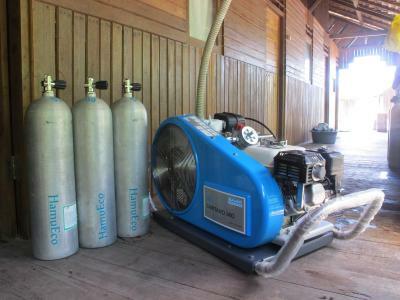 Lock in a great price for Hamueco Dive Resort Raja Ampat – rated 8.3 by recent guests! The facilities were very good and side trips well organised. 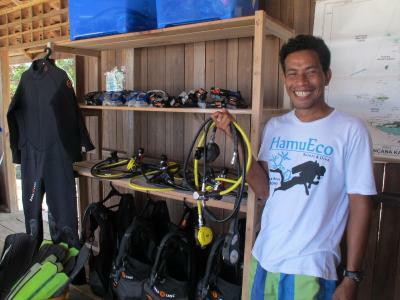 We stayed at hamueco dive resort for one week and had a great time. 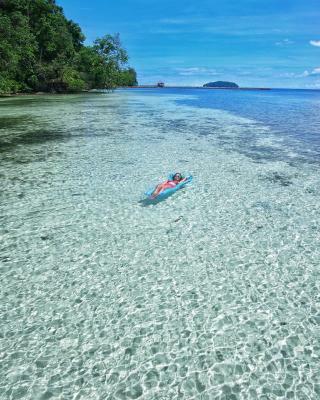 Raja ampat is beautiful! The team was very friendly and the food was good, too! 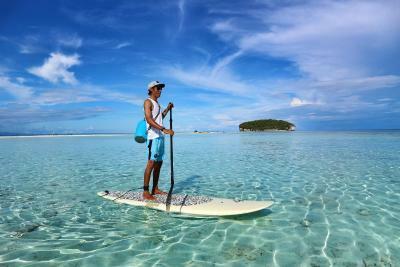 Raja ampat in general is very expensive. It’s not possible to pay the price for a snorkling trip if you dont find other people to join. We went diving with another diving school which was cheaper! Location was great. Quite remote. Great staff and dive master. the food is tasty , the staff are friendly and helpful. the manager is helpful and a good seller for his business . 2 adults with 15-year old child. We had 2 rooms on water. 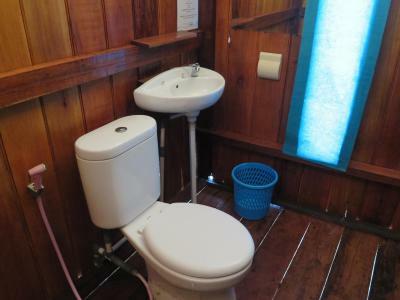 Very clean with white bed sheets, private toilet & shower – all practical and clean. Air conditioning and fan were a treat (power from 6pm till morning). We stayed for the same per person rate in the Alter Native Stay for 2 preceding nights and there is no comparison - like day and night. This place is luxury and far better. Great beach for swimming and snorkelling with safe platform. At least 1 person speaks English good enough to help you out with everything. Highly recommended. We were sceptical because of the low price, but that was a big mistake and I wish we would have stayed there for all 3 nights. 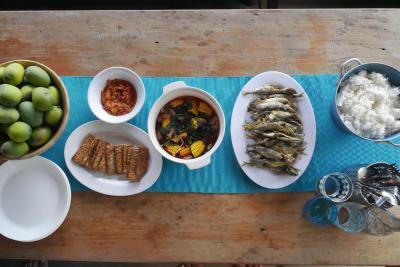 Friendly staff, nice food (tasty fish for dinner), resort is close to town and give access to hospital/pharmacy. The pick up arrangement and transportation was perfect arranged. 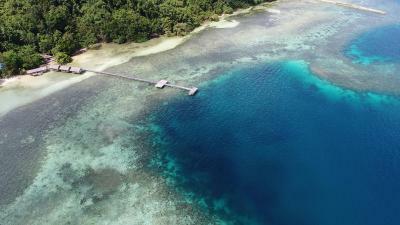 Good jetty for easy access of the reef/sea. Amazing scenic place , very friendly and welcoming staff and overall good arrangements to keep guests comfortable. The staff is amazing and open to suggestions. 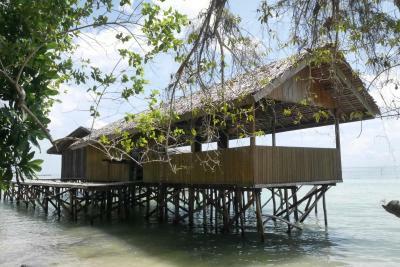 The huts over the water (all have a bathroom and airconditioning now) are great; very basic but functional. The diving and snorkeling is phenomenal , couldn't get enough! 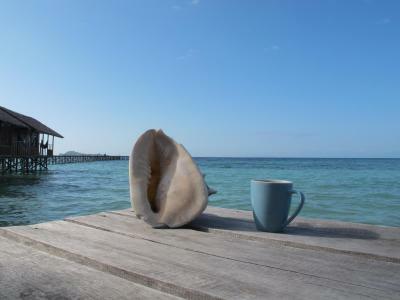 Hamueco Dive Resort Raja Ampat This rating is a reflection of how the property compares to the industry standard when it comes to price, facilities and services available. It's based on a self-evaluation by the property. Use this rating to help choose your stay! 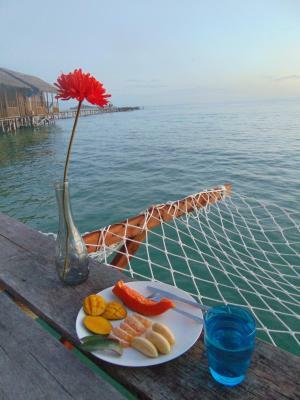 Located in the beautiful azure waters of Rajah Ampat, HamuEco Rajah Ampat offers a quaint beachfront accommodations which include breakfast, lunch, and dinner. It takes about a 3-minute walk from the property to Saleo Beach, and a 15-minute boat ride to Waisai Town Center. 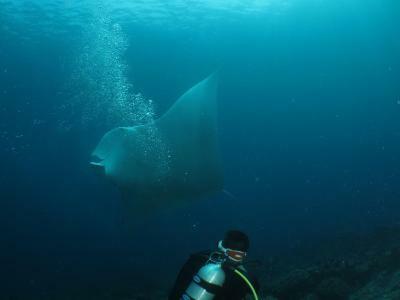 Pulau Kri and Pulau Mansuar diving sites are reachable within a 30-minute boat ride. Getting to Domine Eduard Osok Airport in Sorong will take about 3 hours by boat and car. The wooden rooms at HamuEco are located right above the clear blue waters and fitted with canopied beds with linens provided. 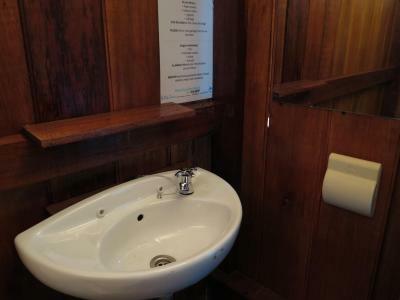 There are private bathrooms featuring shower facilities where towels are provided. 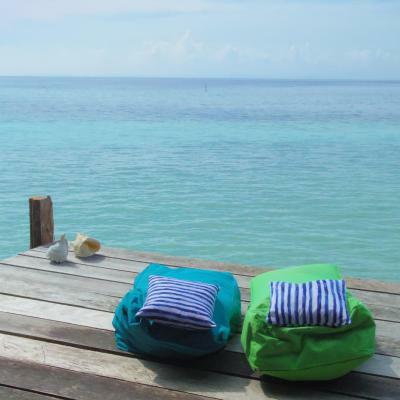 Guests can also enjoy the tranquil sea view from terrace available at each room. Facilities offered at this property include a shared lounge and a sun deck, and a tour desk to help with any travel arrangements. Other facilities like boat shuttle service is available upon request and at an additional cost. 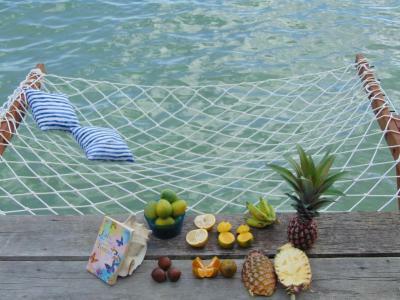 The staff can also help arrange activities like hiking, canoeing, and snorkeling, with extra charges. As for extra dining option, guests can catch a 15-minute boat ride to Waisai Local Market where it serves local and Indonesian cuisine. This property also has one of the top-rated locations in Rabia! Guests are happier about it compared to other properties in the area. This property is also rated for the best value in Rabia! Guests are getting more for their money when compared to other properties in this city. 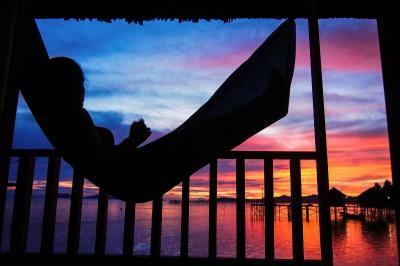 When would you like to stay at Hamueco Dive Resort Raja Ampat? This double room comes fitted with canopied bed and a terrace overlooking the beautiful sea. 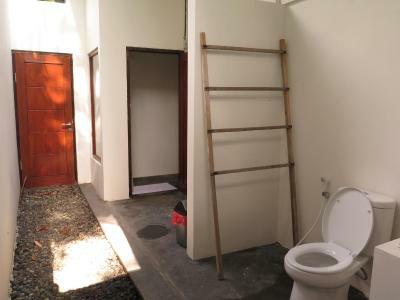 There is a private bathroom which features shower facility and toilet. This twin room comes fitted with canopied beds and a terrace overlooking the beautiful sea. 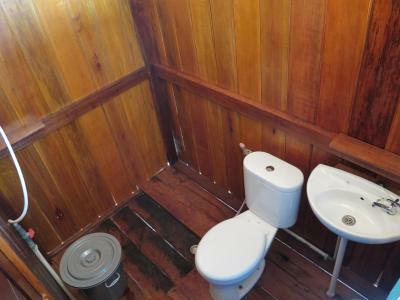 There is a private bathroom which features shower facility and toilet. 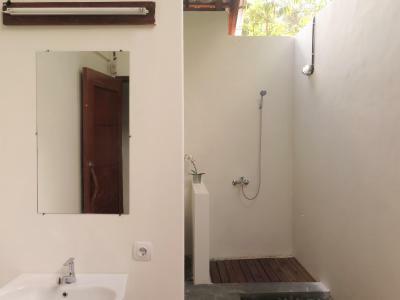 This single room has a balcony, patio, seating area and private bathroom. 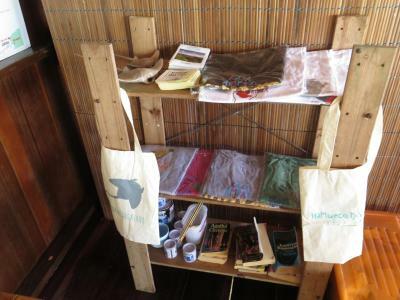 House Rules Hamueco Dive Resort Raja Ampat takes special requests – add in the next step! Any additional older children or adults are charged IDR 800000 per night for extra beds. No soap or shampoo. Mosquitos were a little bad. Could not buy soda or bottled water. Bring your own. The price of this place is too high although the price elsewhere seams to be the same .... in Not confortable space nor luxury ... Raja Ampat is a wonderful destination with a lot to do ( Nature is there , birds , Fish , beaches etc ) but the price really is very expensive . At Hamueco dive resort you have beach at low tide .... dirty so you pay a boat to go elsewhere 1500000 IDR . 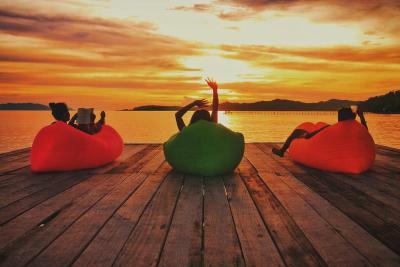 We love Indonesia, in that case the authorities there must think about durability tourism . Food was a little too spicy for me sometimes. But nothing really to complain about. during evening time running compressor to refill the diving cylinder was very loud. Small and bit damaged coral reef in front of the hotel. The hotel is not operated/owned by locals, the money you spend will only partial end up in the local economy! This area does gets a lot of sun even in winter. So it would probably be great to have a common refrigeration place just to keep water and drinks cold. 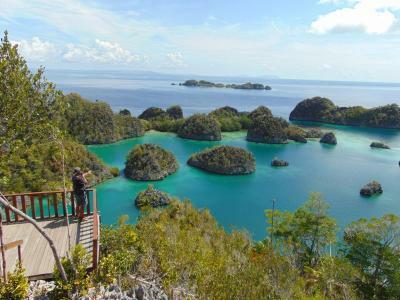 Compared to the rest of the world Raja Ampat is way overpriced, HamuEco is not an exception. I think they could have gone more eco friendly here and there,eg solar panels so we could have electricity and water during the day. There was no wifi ever. The stuff is very welcoming and the manager an excellent professional and great scuba diver guide. 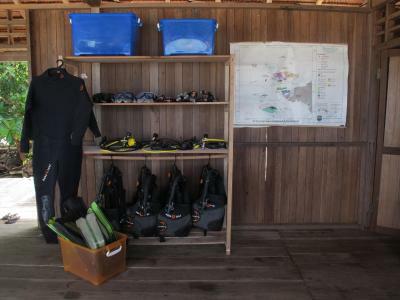 The scuba dives and see excursions were well-organised. The food and the snacks very tasty. The entire team that runs it offered a wonderful experience! Amazing place, quite close to the town, very friendly staff.